Izzy is our precious schapso dog ( an equal mix of Schnauzer and Lhasa apso) . 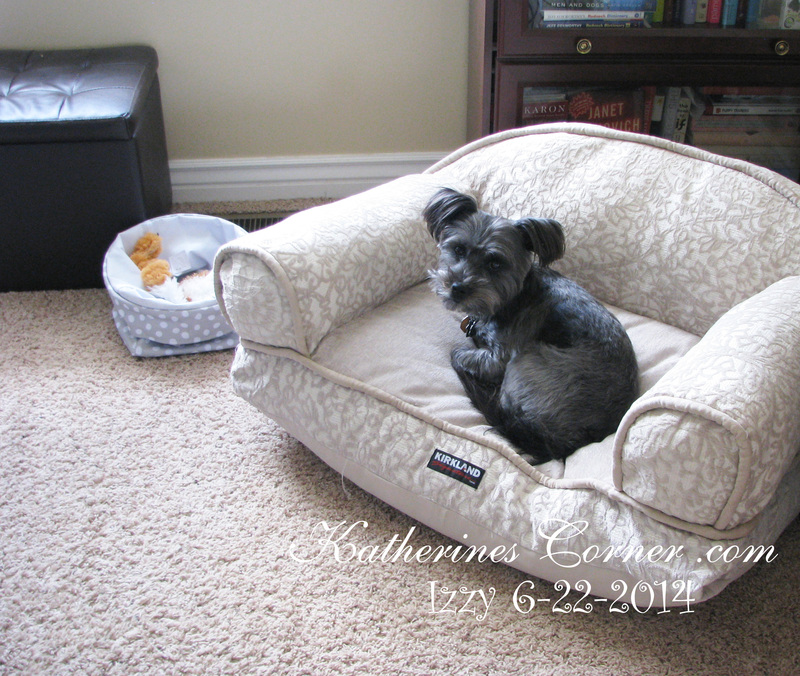 Izzy is the official blog dog here at Katherines Corner and our snuggle bunny. He was one of five in a litter of cute puppies. All girls and our sweet boy. But nobody wanted the male (insert sad face here) . After a day spent “dog sitting” he wanted us and the feeling was mutual! He is such a joy to have in our home and a true part of our family. Often referred to as our boy, baby boy or Izzy Monsta ( monster), depending on what he has been up to that day, LOL. He has been very trainable and can do many wonderful tricks and commands and he recognizes approximately 50-60 words or phrases ( yes I am bragging a bit …sorry, just proud of him). He however refuses to walk calmly on a leash. This is a constant work in progress. We even went to dog training classes to try and master the leash walking. He sailed through the class with flying colors. But walking on the leash continued to be a hurdle. We practice routinely but for some reason he sees the leash as a toy and pulls and tugs and growls ( as if he is playing tug of war). He loves car rides and is always anxious to “go for a ride” or “walk” but he wants to leave that leash behind, LOL. He is a loyal pet and often thinks he is my personal body guard and totally unaware of his size ( all of 13 lbs) he will go toe to toe with any dog including rottweilers and bulldogs three times his size. He is fearless and very protective of me and although it is endearing, you must earn his blessing before you can approach me to closely. I am his Mama in all senses of the word. He is my constant companion. My little shadow of happy . He loves his Papa ( my hubby), He loves my Mother, our daughter and our grandchildren too. search Izzy in my search bar and you will find a lot to make you smile. A Change In Plans Hubby and Izzy taking a nap.